Our permanent location / home is 11 Dove Street, Ipswich. Parking is free after 6pm weekdays and £3 all day at the weekend in the Suffolk New College car park which is on Rope Walk, only a few metres from the venue. Rope Walk has a barrier part way along which prevents access to the car park from Grimwade Street, but does allow access to Dove Street for loading and unloading. 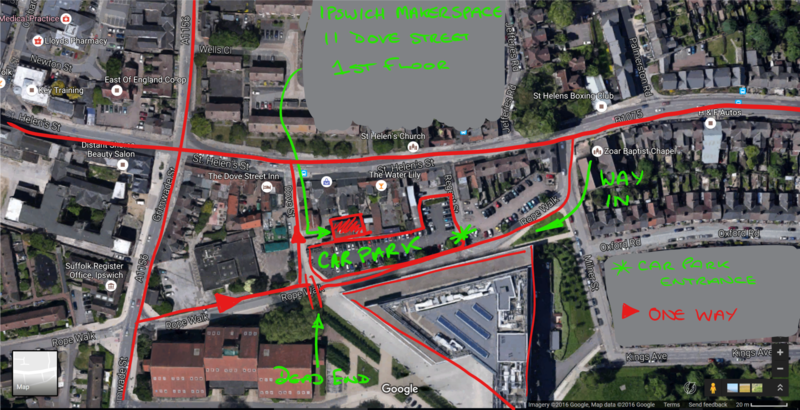 Use St Helen’s Street and Milner Street to get to the end of Rope Walk that does access the car park. There are two car parks, you want the second one but whichever one you choose, please check the regulations just to be sure. We are registered with both Google and Apple maps, so a search for ‘Ipswich Makerspace’ should reveal us.. If you have sat-nav our full address is 11 Dove St, Ipswich IP4 1NG.